Enter Adelaide Thom and Eleanor St. Clair. At their humble tea shop, Tea and Sympathy, they provide a place for whispered confessions, secret cures, and spiritual assignations for a select society of ladies who speak the right words and ask the right questions. But the profile of Tea and Sympathy is about to change with the fortuitous arrival of Beatrice Dunn. When 17-year-old Beatrice leaves the safety of her village to answer an ad that reads "Respectable Lady Seeks Dependable Shop Girl. Those averse to magic need not apply", she has little indication of what the job will demand of her. Beatrice doesn't know it yet, but she is no ordinary small-town girl; she has great spiritual gifts - ones that will serve as her greatest asset and also place her in grave danger. Under the tutelage of Adelaide and Eleanor, Beatrice comes to harness many of her powers, but not even they can prepare her for the evils lurking in the darkest corners of the city or the courage it will take to face them. Urban Fantasy novels about witches are popping up everywhere but the vintage setting for this one intrigued me and I would say that the setting and characters have been lovingly crafted so that I was able to easily feel like I was there. While all three of our main witches are intriguing Adelaide was a favorite for me with her world-weary, take-no-$#@&amp; attitude and her personal style. I only gave the story itself three stars as it seems to be trying to set things up to be a longer series. That may pay off in the long run but in this novel it meant that about four storylines were set up, developed and then left without resolution at the end of the book. This book has some interesting themes - 19th century Comstock laws, magic, feminism, misogyny via the persecution of witches, but none of them are really fleshed out. It feels like a much longer book that got cut down a lot. You meet plenty of people but don't really get to know much about any of them or their motivations. The ending also was deflating. So many loose ends left open. I thought the narrator did a good job. 66 sur 68 personne(s) ont trouvé cet avis utile. In full disclosure, this was the first time I have ever listened to a novel instead of read it. I thought I’d enjoy it during my 45-minute commute each morning and evening and was looking forward to the 14.5 hours I wouldn’t need to find something to fill the time. The problem is, I loved the story so much I couldn’t put the book down and I finished it MUCH sooner than planned. Not a horrible problem to have! LOL The other note about listening instead of reading (on my Kindle) is I missed the ability to highlight specific/favorite words and phrases. I read in a book review that the “book is beautifully formatted, with lots of drawings throughout and pictures of old newspaper clippings inserted between the chapters.” Unfortunately, I missed all of that too because of listening to the Audible version. BUT, I absolutely loved listening to Julia Whelan’s inflection and many voices…I will definitely seek out other novels narrated by her. Overall, I thought the story flowed and is very lyrical, alluring, delicious, and wickedly fun. I was engaged from the start and, as I mentioned above, I didn’t want to put it down. The characters are wonderfully detailed. I loved the tidbits of information sprinkled unexpectedly throughout the story; those bits of details sometimes felt out of place but then, brought to the surface later, are why the time period and individual characters are so well developed and the story so enduring. Love it and recommend it!! Pagans, this book is for you. This book was exactly what I was hoping for. Great imagery, great characters. The story wasn't too heavy, without being paper thin. The author obviously did a great deal of research and applied it to the story wonderfully. I don't want to blather on all day. If you enjoyes practical magic (book or film) you'll like this. 69 sur 74 personne(s) ont trouvé cet avis utile. 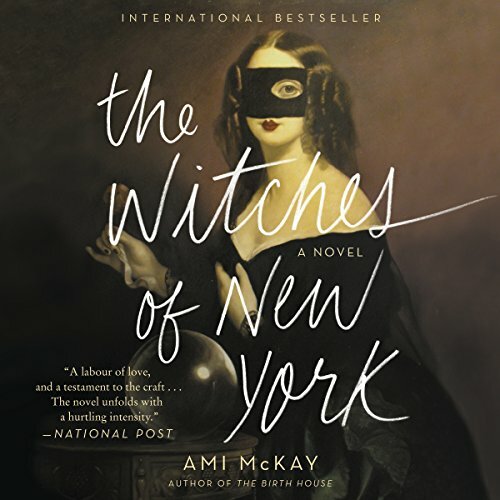 Ani McKay has created memorable characters in her trip of witches and in the ones who aid or afflict them. She also captures the time and place of NYC in the 1880s. A great book for witches, feminists, historical novel lovers, and familiars. Not recommended for the narrow minded. I love all kinds of books. but I didn't expect much from this title since the last ones I ordered before were just ehhhh. This is perfect for those who believe in a little magic and a historical setting. It is set in NYC, my birthtown. They even described the exact street and avenue I grew up in, so I was instantly hooked. I will be looking for more. I enjoyed everything about this book. The story was interesting and I really felt transported back in time to New York. I loved the way aspects of history were woven into the tale. The characters were interesting, and the narrator was able to switch voices in a non-jarring manner. This really increased my enjoyment of this audiobook. I normally do not listen to works of fiction. I normally read fiction in book form and listen to non-fiction via audiobook. This book was so fantastic, I might have to start listening to more fiction. I didn't want this story to end! I recommend this book to anyone who likes a good story, lovers of history, and those interested in the supernatural. This is also good for people who enjoy a story about strong female characters. NOTE: I listened to this book in autumn. This likely enhanced my listen, as it happened to be the same time of year when the story takes place. I liked this book so much, I will likely listen again next year! yes, this was a really fun read and it makes you feel inspired. Julia is a very talented story teller. I did cry at one point but I'm way to emotional so I wouldn't put much stock in that. I cry during commercials sometimes! Had this book not been narrated by the wonderful Julia Whelan, I would have thrown the towel in LONG ago. She could read the phone book and I'd still listen. Well done to her on this performance!! As far as the story goes, this book seemed like it'd be right up my alley. However, the story fell short. There was no real plot line therefore little resolve at the end. The book just ended. There were so many characters and plot lines open that I honestly ended up getting annoyed at the lack of a true plot line. I found myself dreading listening to this but knew I needed to power through and finish. Overall, I'm just glad it's over with. I love this book, I believe it's my new favorite and I hope you read it!